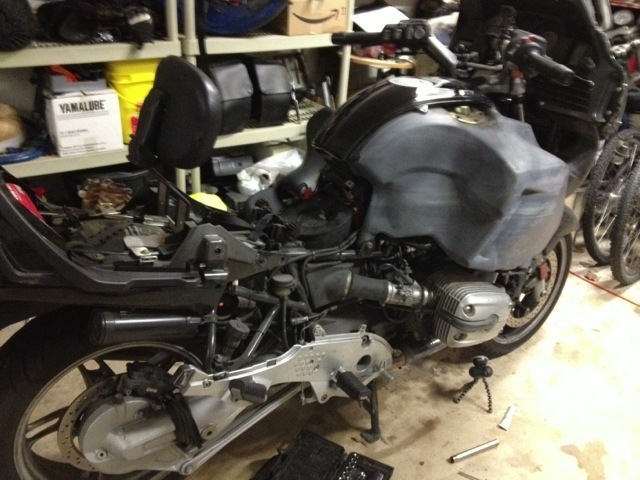 All of the parts and supplies are in, so I’m getting started on the 72,000 mile service on the R1150RT. The first things to do are to take off the hard bags, then put it up on the center stand and remove the seats, tank bag, and fairings. Once I got that out of the way, I started in on the work by replacing the air filter. The old one was filthy and the airbox was full of dead bugs, mostly butterflies and grasshoppers, which had to be vacuumed out. Once the new filter was installed and the airbox buttoned back up, I started in on the spark plugs. There are two per cylinder, and while the left hand cylinder went fine, the right hand one threw a monkey wrench in to my plans. The secondary plug’s boot isn’t sealing and the connector has rusted out. I actually dumped rust out of it when I pulled it off. That’s now on the replace list. With all four plugs replaced, I buttoned up as much as I could, and headed in. Tonight’s homework is to find the plug wires, a new socket for the front left turn signal bulb, and LED bulbs for the speedo and tach and get them ordered.